Soy sauce and sriracha marinated roasted mushrooms for a savory bite. Easy to make and addictive. Welcome to 2014! Have you resolved to eat more veggies? The common theme I'm seeing among a wide variety of eating styles, from vegan to Paleo, is this: eat more vegetables. The best way to eat more vegetables is to have them in your kitchen. A terrific way to get vegetables into your kitchen--while supporting your local community--is to find a Community Supported Agriculture (CSA) farm share near you. On the left side bar you'll see a Local Harvest gadget. If you're in the US, you can type in your zip code and see what's available in your area. If you live in the Seattle area, you can buy direct from local farmers via Farmstr. Check out Farmstr here. I always want to eat more veggies, so I've got another awesome veggie appetizer for you. This one came about as a happy accident. Like Liz, I attempt to maintain a well-stocked Asian pantry. I was at the grocery store, swinging by the fancy cheese section looking for magical markdown stickers when I tried a sample of teriyaki marinated mushrooms (my eyes are starting to read 'magical mushrooms' right now, and while these tasted magically delicious, they are not that kind of mushrooms). 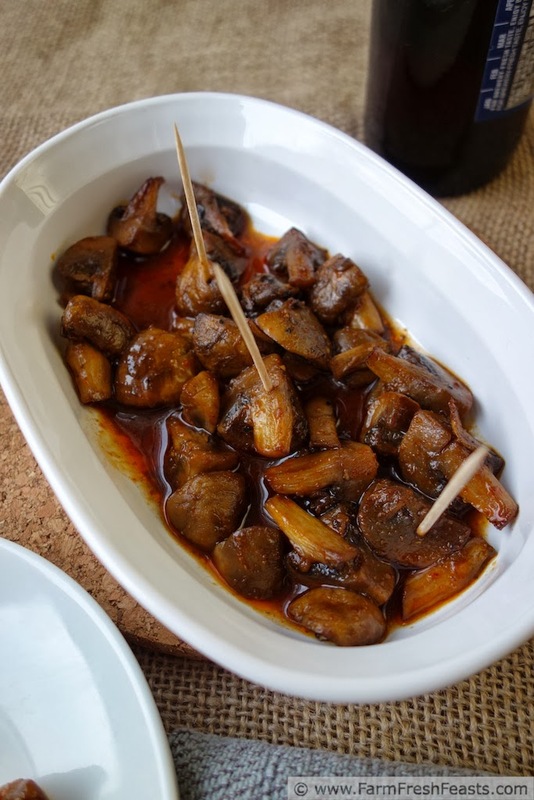 Those teriyaki mushrooms tasted so delicious I resolved to make them at home right away. My spouse and I are the ones who enjoy mushrooms in our house, so I figured I'd branch out from our Skillet Mushroom Dip for Two and have another easy, eat it hot or warm or room temperature make ahead mushroom recipe in my repertoire. I consulted this week's library loan cookbook, All About Roasting: A New Approach to a Classic Art (Amazon affiliate link), and adapted Molly Steven's roasted mushroom recipe. I intended to splash in some teriyaki sauce after the mushrooms were done, but as you can see from the title that didn't happen. I forgot that I'd used up all the teriyaki sauce in this meal. Oops! Well-stocked Asian pantry fail. Instead I grabbed the sriracha and the soy sauce and made a delightfully zingy marinade. This is easy. This is fast. This is a make ahead. This is an awesome veggie app! To find more awesome veggie apps and snacks, check out my Pinterest board. For other recipe ideas using mushrooms, please see my Mushroom Recipes Collection, part of the Visual Recipe Index by Ingredient. Want to know How to Use This Blog? Click here. Preheat oven to 425 degrees Fahrenheit. Line a rimmed baking sheet with a piece of parchment paper if you prefer easy clean up (and I crumple my parchment paper then smooth it, as shown, so it doesn't curl up on me). 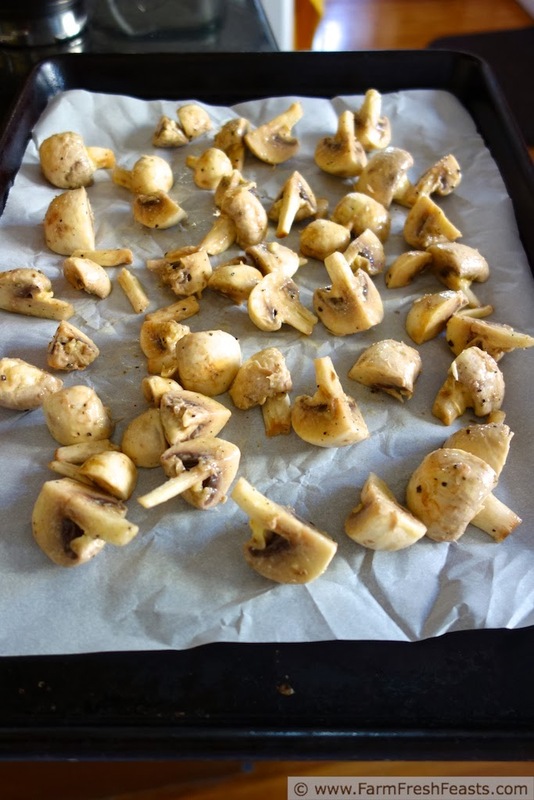 Clean and chop the mushrooms into quarters or halves, then transfer to a large bowl. Toss with butter and olive oil until thoroughly coated. Sprinkle generously with salt and pepper. Spread on baking sheet. Bake for 10 minutes, then flip to another side (can't really flip over, exactly) and roast another 5 to 10 minutes until the mushrooms are lightly browned. While the mushrooms are baking, mix the sriracha and soy in a small bowl and set aside. Once the mushrooms are done, return them to the large bowl and pour the sriracha-soy marinade over top. Stir gently to coat the mushrooms in marinade. 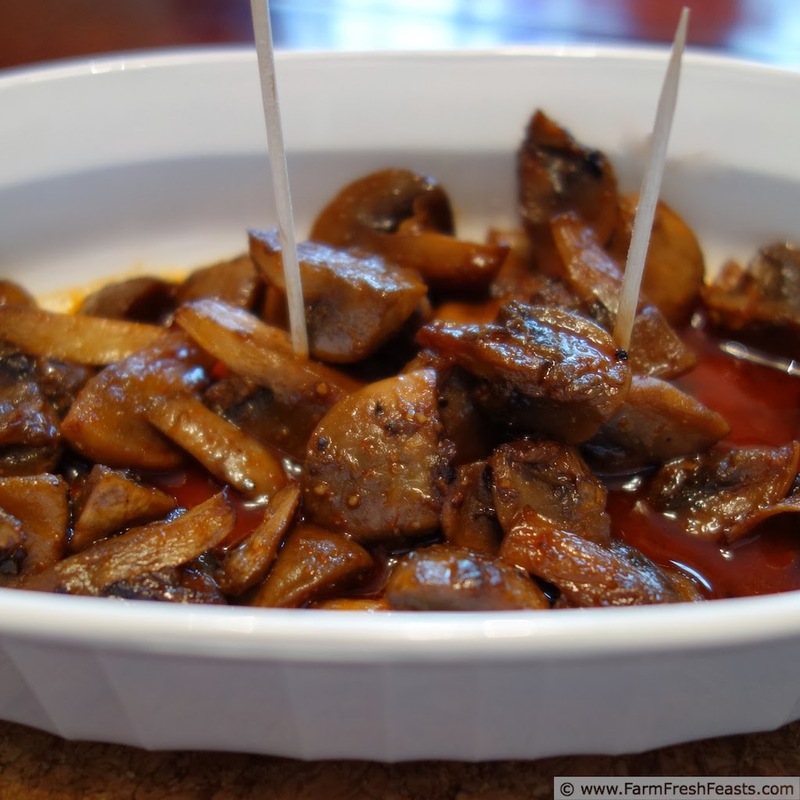 I love mushrooms and I love spicy, asian sauces, so these mushrooms are right up my alley. What a great flavor combination I bet they have! Happy 2014, dear friend! PS. I can't wait until I move back to the coast this Summer - CSA again, here I come!!!! PPS. Happy Jan 1! xoxoxoxo! I bet living in Japan for a bit, and Hawaii for a while, has helped me with my Asian pantry. I just discovered Ma Po Tofu sauce at the market and I'm so excited to play with that this year. I'm glad you'll have a CSA again--we had our CSA contract signed before we closed on our house here! I'm one of those "eat more vegetables" people, although I'm not following any diet plans. I've been told to look into a CSA, but since I only cook for me, I wonder if I would be able to eat it all? I'd hate to throw out any produce (or any food for that matter). Do you know if they make CSAs for one person households? I'll have to ask. I love chicken teriyaki and mushrooms, so I know I'll love this teriyaki mushroom recipe. The whole Community Supported Agriculture thing has exploded in recent years, and many farmers are offering customizable plans (order what you want) as well as different sizes. I've split a share before, once when the spouse was on another deployment and I didn't think we could eat it all. Now I have another small freezer (aka microwave stand) that holds my excess until I'm ready to use it, and that's what we'll eat out of (berries for smoothies this morning that I froze last summer, and your peach pie filling is in there too!). So true! I love vegetables and have them at every meal (including breakfast). Great way to use up mushrooms. Happy New Year! I need to get better at veggies for breakfast--I've got several Big Deal breakfasts with vegetables, but for everyday meals unless I throw carrots, beets, or cabbage into a smoothie it's veggie-less. Happy New Year!! Welcome back; it's great to see you again. I'm excited to see what veggies you get into this year, especially if it involves more Fattoush Dip. Just for you, special price, I'm going to play with the winter veggies, sumac, and bags of chick peas. You're an excellent inspiration. Happy New Year! 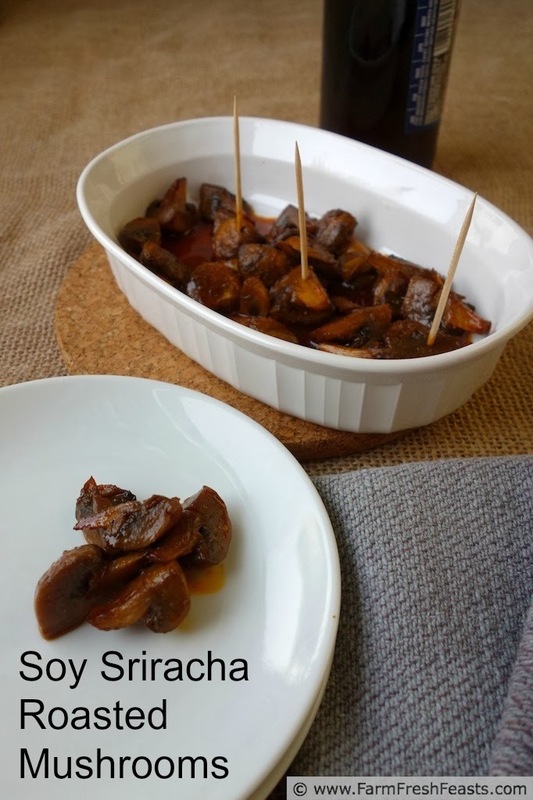 I don't think there's any way to prepare mushrooms that I wouldn't love, BUT add Sriracha into the mix, and the recipe moves right to the top of my list. I'm pretty sure I could eat this whole amount myself. I admit I had a real hard time keeping my hands off of them in order to take photos and save some for the spouse--and then when he tried them they were gone! My hubby would LOVE these. He is such a mushroom fiend. Me, I'm not quite there yet; mushrooms and I have an arm's length relationship, which is much closer than it used to be! I do like them incorporated into a dish, like pasta, pizza, on a burger, etc, but I haven't really tried just eating mushrooms recently (and the last time I did, didn't go so well). Oh, and fughettabout raw mushrooms - that just ain't happening. But I love the way you seasoned these up, so I think I should give it a try! Just make some mushrooms for your spouse--as a gift of love--and dig in to something you do enjoy. Life is too short to eat things you don't really like, you know? stopping by from tasty tuesdays and love your recipe and blog. my sister and i are mushroom lovers and i will be sharing this recipe when she comes and visits. Thanks for your kind words! I hope you and your sister enjoy this recipe! I think I could eat the whole batch all by myself! Thanks for linking up with What's Cookin' Wednesday! Get in line, my friend, I could eat them all too! It was a challenge leaving them alone after photographing them, and a bunch of taste testing, so that I could share with my spouse. Congratulations!! Your recipe has been featured at Tasty Tuesdays 44 on my blog, Lori’s Culinary Creations. Hop on over and grab a feature button and link up your latest culinary creations. Congrats again. Thanks so much for featuring my mushrooms! I wanted to love this recipe, however it is much better on paper than real life. I made it exactly as described except I put the oven at 385 degrees because olive oil does have a burning point that turns it into nothing short of harmful when eaten. Before I put in oven I coated with just over a tablespoon of evol and salt and pepper as stated. I baked for 15 min then turned over with a fork each piece and put back in oven for about 10 min. I mixed up 1 tsp sriracha and 2 tablespoons soy sauce and added to the mushrooms when done in oven. Too much sodium!! Plain and simple, too much sodium. I realized that 2 Tablespoons was quite a lot for this recipe, but to taste all that sodium from the soy and then to salt this before cooking, wow, too much salt! If I ever do something similar again I will halve the soy sauce, add some minced garlic or honey. Very disappointed with this recipe. I'm sorry you were disappointed in this recipe. I know taste is subjective, but let's see if I can troubleshoot a bit for future success. What type of soy sauce did you use? I only buy low sodium soy sauce, the green label Kikkoman usually, and will adjust the recipe to reflect what I use. I also use unsalted butter--another possible source of additional sodium. To season the mushrooms, I used Diamond Crystal brand kosher salt. The irregular shape to the flakes means that my "pinch" holds less sodium than a pinch of table salt. When we ate the mushrooms, we got all fancy with toothpicks so not all of the soy/sriracha was eaten--a fair amount ended up in the dish. I think my son added some rice and ate that as a snack. That being said, minced garlic and honey would be a terrific addition to the sauce. Thanks for the the idea!